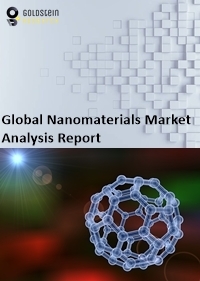 Global Nanomaterials Market by Product Type (Dendrimers, Nano-Clay, Nano-Wires, Nano-Tubes, Nano-Fibres, & Nano-Particles), by End-User (Construction, Transportation, Electrical and Electronics, Healthcare, & Water Filtration). and by Region with Market Forecast for 2016-2024. Nanomaterials are tiny particles or substances consumed at a small scale and their size ranging to the scale of nanometers. Nanomaterials have enabled nanotechnology to become one of the newest technologies in the market with the wide range of applications such as medical, aerospace, defense, energy, construction, automotive etc. One of popular application of nanomaterials is nanotubes, which are one of an illuminative example for the potential of nanotechnology. Goldstein Research analyst forecast the Nanomaterial Market size is set to reach from USD 4.9 billion in 2016 to USD 17.8 billion by 2024, at a CAGR of 17.63% over the forecast years 2016 to 2024. Electrical & electronics, pharmaceutical, and chemical products are the major application segments of global nanomaterials market that drives the respective market. The report covers the present ground scenario and the future growth prospects of the Nanomaterial Market for 2016-2024 along with the adoption rate of nanomaterials in various verticals and the ongoing research in the field of nanotechnology. We calculated the market size and revenue share on the basis of revenue generated from major players across the globe. On the basis of end-user, electrical & electronics segment dominated the market with 17.5% of total nanomaterial market share in 2016. Healthcare is the fastest growing segment registering the growing CAGR of 15.75% over the forecast period due to the increasing population and awareness regarding health issues and diseases. Nanomaterials are widely used in the healthcare industry for body implants, disease diagnosis, medical devices, screening technologies, dental filling materials, etc that tends to drive the nanomaterial demand in healthcare sector. Nanomaterial Market Outlook 2016-2024, has been prepared based on an in-depth market analysis from industry experts. The report covers the competitive landscape and current position of major players in the global nanomaterial market. The report also includes porter’s five force model, SWOT analysis, company profiling, business strategies of market players and their business models. Global Nanomaterial Market report also recognizes value chain analysis to understand the cost differentiation to provide competitive advantage to the existing and new entry players. Our global nanomaterial market report comprises of the following companies as the key players: Covetsro, Arkema, Nanocyl, Showa Denko, Air Products PLC, Cnano Technologies, Nanophase, and Glonatech SA. Other high-flying vendors in the market are: Ahlstrom, Bayer AG, CNano Technology Ltd., DuPont, Elmarco, Evident Technologies, Finetex, Glonatech SA, Hollingsworth & Vose, Hyperion Catalysis International Inc., Kuraray, Nanodyanamics, NanoledgeInc. Nanosys Inc., Nanoviricides, , Zyvex. According to the report, the major driver of the global nanomaterial market is the extensive growth in the electronics market which leads to constant increase in the usage of nanomaterials in United States and is expected to witness consistent growth during the forecast period. There is a consistent increase in the healthcare industry especially in the nanomedicine field. The main application of nanomaterials in the healthcare sector is the nanodrugs and nano compounds. Further, the report states that the major challenge is toxicity and environmental related risks from nanomaterials. The nanomaterials that are manufactured in paints, fabrics, and personal and healthcare products including cosmetics and moisturizers releases intentional and unintentional atmospheric radiations. Radiated nanomaterials eventually deposit on land and water surface leading to contaminate soil and ground water. Based on geography, North America held the highest share i.e. 45% in the nanomaterial market in 2016 due to wide ranging application of nanotubes. The major application sectors of North America market is electrical& electronics, pharmaceutical, and chemical products, whereas the nanomaterial market in North America is expected to grow in chemical products and electrical& electronics in forecast period. APAC is expected to witness substantial growth of 13% over the forecast period due to increase in population of China and India leading to the growth in construction industry. Furthermore, there is increase in investment in R&D which is increasing the usage of nanomaterials in healthcare industry. What is the revenue of Nanomaterial in 2015-16 and what would be the expected demand over the forecast period?